income and equality and wealth equality. If you read the New York Times of course you see his work often. He's a collaborator of course with Thomas Piketty who's been in the news a great deal lately. give is that inequality is important because the public cares about inequality. In other words, people live and rate their own situation and economic wellbeing by comparison with others in society. ways to think about inequality. and remember, you know, governments are big and they play a big role and disposable income is typically significantly less inequality than market income. So one simple way to look at inequality or to measure inequality is to ask the question what share of total pre-tax market income goes to various groups in the population? So that's the top 10% of 1%. about 25 countries have been analyzed so far. So this started with Thomas Piketty in the early 2,000's studying France so then I worked with Thomas Piketty and analyzed the case of the United States. North America with some developing countries such as China and India as well. 1928 just before the Great Depression. Now, that's what happens to the top 10% that gauge, you know, from 33% to 50%. So the next graph splits the top 10% into three groups; the top 1% in black, the next 4% in blue and the next 5% in red. probably fortunes that were inherited from the gilded ages and the industrial development of the United States. changes the political economy of this enormous increase in income inequality. ownership and more pension. The value of homes has fallen in large part because those homes, you know, they are much bigger mortgages and that against those homes. has a level of wealth concentration as high probable as it's ever been. Okay? increase in income concentration in recent decades. The U.K. and Canada have also seen a large increase in income concentration not as extreme as the United States, but still pretty significant. inequalities and in others, not so much. with those development and income concentration is tax progressivity. So here is a chart that illustrates those results. most are the countries that experience the biggest increases in income concentration. Now, you may say perhaps that's a good thing to lower top tax rates and see incomes at the top grow. Okay? So the broader question is this really stimulating the economy and increasing economy growth? 1913 and then, let's see how those incomes grow in real time over a century. dots, you know, four diamond points here are almost flat which is another way of saying that economic growth was really driven solidly by the top 1% with the bottom 99% income stagnated. modern rate; let's say, the modern rate range, wealth concentration is likely to keep increasing and we're likely to see a progressive shift from self-made wealth towards inherited wealth at the top. detail. But two elements that are likely to shape in part views on tax progressivity is a perception that perhaps top 1% income gains do not benefit the 99% which seems clearer from the U.S.
majority-dominated generation of today can retire and have some medical security? Wealth/White Wealth," little did we expect the racial wealth gap to rise so dramatically. Got to push harder. crucially determined by the assets families are able to command. As sociologists we are all pleased that inequality has finally broken through and there's not a growing public conversation about it. the roots of the growing racial inequality and wealth that's the hallmark of this toxic inequality. Tom? African-American family has five cents in financial net wealth for every dollar of wealth that the typical median American white family has. are experiencing American tax policy and American social policy that might be driving this set of widening factors. could look at spells of unemployment and look at the length of unemployment, the frequency, the kind of work and wages and hours that people came back to. families, so the ability to inherit more than once is really not very likely. Recession that subprime and predatory lending was much more likely to be targeted and impactful of communities of color. relatively well to do homeowners purchase homes, stay in their homes and grow wealth while all that is happening. think this really underscores their work. Melvin to try and wrap some of this up and provide a particular point of view that we've been working on. with rules that were self-interested, but very little about race. debates. And finally, a wonderfully powerful YouTube video seen by over 15 million viewers that we want to play a small piece of that will give you a sense of that. Can we play it? to our perception. The ideal is as far removed from our perception of reality as the actual distribution is from what we think exists in this country. quintile they fall into. Now, let's reduce the total wealth of the United States, which was roughly $54 trillion in 2009 to this symbolic pile of cash and let's distribute it among our 100 Americans. keep our country moving forward. and yes, Republicans and Democrats alike chose this curve. Nine out of 10 people, 92%, said this was a nice ideal distribution of America's wealth. But let's move on. about 10 times that of the still healthy middle class. Sadly, this isn't even close to the reality. Here is the actual distribution of wealth in America. The poorest Americans don't even register. They're down to pocket change and the middle class is barely distinguishable from the poor. In fact, even the rich between the top 10 and 20 percentile are worse off. Only the top 10% are better off. he won't fit on my chart. One percent of America has 40% of all the nation's wealth. The bottom 80%? Eight out of every 10 people or 80 out of these 100 only has 7% between them. selected. Her book is The "Undeserving Rich: American's Belief about Inequality, Opportunity and Redistribution and the Author Makes Critics session will be at A.S.A tomorrow afternoon at 2:30 p.m.
focus my talk tonight on the political discourse of inequality and by that I mean policy preferences related to inequality, as well as broader political and economic strategies to reduce inequality. from various public opinion polls throughout the talk. increases above zero in the early and middle 1990's and again in 2012 relative to the base year of 1987, although I am just highlighting here the effects of 2012 relative to 1987.
affluent endorse a substantially lower level of pay inequality than exists. calling the opportunity model of beliefs about inequality. of shared prosperity. 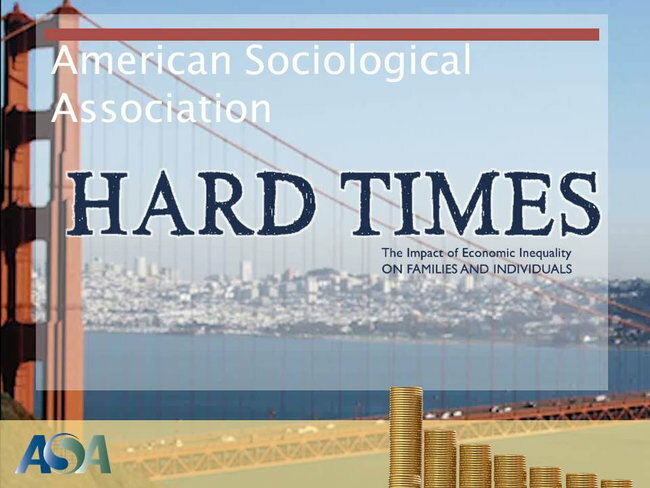 What matters are the perceived consequences of economic opportunity and not the absolute levels of inequality per se. main way to address current economic insecurities. mark, such support is actually fickle in the moment. When it comes to specific pieces of legislation as Larry Bartels has argued, the benefits are often not very clearly conveyed to the public. redistribution and I'm going to focus on two things that are missing from the dominant models, labor market redistribution and education. So first, labor market redistribution. This simply remembers to any action that reduces disparities in pay and earnings in the labor market. Widely discussed examples are unions and the minimum wage. the upper class implies a rejection of the notion that economic growth is sufficient to reduce inequality; that is equitable growth is what's required. as important a part of the opportunity agenda and the social inclusion agenda as our educational initiatives for the low income children. today can learn a lot from the politics of racial, and gender inequality and indeed must begin to incorporate these moments into its own so I'm echoing here Melvin Oliver's points. programs over time. So that's education. the greatest responsibility in reducing pay disparities. themselves -- they should be making efforts, working harder, that sort of thing to increase their earnings, private charities, high income individuals themselves, government or major companies. some have argued that lower marginal rates give executives a greater incentive for to push for higher compensation because they get to keep more of it. You know, that's out there in the literature. shareholder value as the preeminent goal that identified high executive salaries, they identified them with high stock prices, and therefore see them as a good. graph. So that's my comment on that very important paper. white communities. So I think some discussion about the importance of the quantities and the importance of their returns to these quantities would be worth getting into. The other comment that I wanted to make has to do with a question of what is causing these differences. And of course this is a very complex question. Home ownership -- to buy a home, one needs money. unable to find an actor or actors who can address the problems of inequality, inadequate opportunity and anemic growth and living standards. benefit the general interest or even the bottom 99% which is like not everybody, but most of us. >> Well, great. So we have time for discussion and questions. But let me begin by seeing if the panelists want to reply. Leslie, do you want to talk? at the state level in which taxes are raised on the wealthy for explicit quid pro quo for education, health care, and public safety. quite supportive. And so I would turn that around and say that that is really an issue of the lack of political and economic leadership. Not to diminish polarization though. >> And what about this issue -- Tom and Melvin, do you want to talk about the policies to close the racial gap? part of the gap, a huge part of the gap, is taken up there. moving into those communities and the benefits. from the ground, and tax policy also in terms of national legislation. There are a lot of levers and many of those are being worked on. that is why the issue of distrust in government, I view that as the biggest hurdle that the United States is facing to address the issue. >> Leslie, did you want to reply to that? thing. If you look at public opinion polls on regulation of business, there is quite a lot of support for regulation of business. 30 seconds, and if you have a comment, within one minute. So we have two microphones if people have questions for the panelists. convince whites they should give up that deduction? How do you win that kind of support? Unfortunately, it sounds incredibly pie in the sky, that you could wish it away and produce greater equality. But interest on the part of the white population in protecting that deduction, I don't know how you overcome that, to convince them it's a good idea to lose that for the benefit of others. >> Do you want to start? policies that continue to leave behind those who are racially disenfranchised. going to have a strong voice there. >> Another succinct question on my left? sort of understand how public opinion gets shaped in these different parts of the country, too, and maybe this is part of the explanation for why it is so difficult to get the money out of politics. >> Emmanuel, your research really shows the role of the state in influencing these. Did you want to chime in here? then World War II to drastically change policies. Now we can say the Great Recession was a big shock, but in terms of policies, probably it's not going to be a watershed event like the new deal was. >> We have time for one more question. wealth haven. Do you agree with Piketty about this? set up a global world tax. I mean that is a state Utopia. Those issues, how do you tax moving wealth, in corporations, and multi-nationals is going to play a bigger role in the debate. estate is exempt so you're taxed on the first dollar after that, and the tax rate is lower than it had been in the previous 10 years. the United States because of our constitutional history, it is very difficult to have a wealth tax.